Google only announced that it had secretly stuffed new, custom "Pixel Visual Core" chips into its new Pixel 2 XL phones earlier this week, perhaps in expectation that someone like teardown iFixit was going to rip open the devices and find them anyway. And, sure enough, iFixit's recently released teardown for the Google Pixel 2 XL reveals the powerful imaging-focused chip humbly packed in beside the familiar Snapdragon 835 processor. It's not even currently activated. That's remarkable because our review of the Pixel 2 XL already praised the "absolutely killer camera," and then Google surprised us with the news that it'll eventually get better with the Visual Core. Once the Visual Core goes live with Android 8.1 in the next few weeks, Google said in a blog post that you'll be able to take HDR+ photos five times faster and with one-tenth the power of the Snapdragon processor the Pixel 2 XL currently uses. That speed and efficiency comes with all kinds of perks, including better shots in dim light, better zoomed-in shots and crisper images in portrait mode. You can see the chip in plain sight in the image below, marked with the label SR3HX X726C502. The Visual Core is Google's first custom chip for the Pixel, and it clearly represents an effort to compete with Apple and its custom A-series chips for the iPhone. 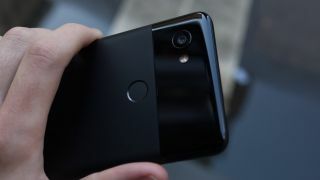 As in the case of the A-series chips, the Pixel Visual Core is custom-designed to boost certain features above what you'll get with standardized processors, which in this case naturally means improvements for the camera that Google has made such a key aspect of the Pixel's appeal. In time, Google will also allow third-party developers access to the Pixel Core's HDR+ capabilities. iFixit's teardown revealed few other surprises, but it's worth checking out for glimpses of the device's firm magnesium shell, its sensors for Active Edge and a new heat pipe that'll help cool the device once the Pixel Visual Core is running. iFixit also knocked the Pixel 2 XL's repairability rating down by one point from last year to 6 out of 10, partly because of a stronger glue used for the device's battery.